A few of the most popularly prescribed sleep aids fall into the family of pharmaceuticals called, benzodiazepines. These potent drugs produce a sedative effect that’s useful for treating insomnia. But the chemical mechanism makes them useful in many other medical applications including, treatment for anxiety and seizures (Valium and Ativan, for example), and as a sedative and anesthetic for some medical procedures. First, benzodiazepines have been on the open market since the late 1960s. Valium was one of the first and has continued to be popular as a tranquilizer and sedative. So how do they work in your brain? The neurological processes in your brain are complex and your natural sleep-wake cycle is a part of them. When your sleep is disturbed not only is the loss of sleep a nuisance, but it can take a toll on your physiological state and even be a root cause for some medical problems further down the road. Essentially your biological clock that usually runs in sync with the natural world automatically creates rhythmic rises and falls in brain melatonin, a natural sleep chemical. When you experience insomnia this natural process is disrupted: you could be challenged with falling asleep, staying asleep, or going back to sleep early in the morning—all of which have to do with melatonin production, plus. Benzodiazepines bind with the GABA receptor in your brain, a neurotransmitter, to increase a chemical that inspires drowsiness or sedation. Most benzos are very quick to act and have a brief half-life that makes them particularly useful for treating sleep onset insomnia or middle insomnia (trouble staying asleep, or waking in the middle of the night). In the past physicians have been quick to treat insomnia pharmacologically, with prescribed sleep aids or hypnotics. Benzodiazepines have been useful particularly as anti-anxiety drugs and a growing number of non-benzodiazepines are widely prescribed for insomnia: Ambien, Lunesta, and Sonata. While structurally distinctive these non-benzo sleep aids work in much the same way, by stimulating your brain’s neurotransmitter responsible for production of a sedating chemical. Most benzodiazepines however are useful short-term—your insomnia needs a short and quick jolt to get you back on track. 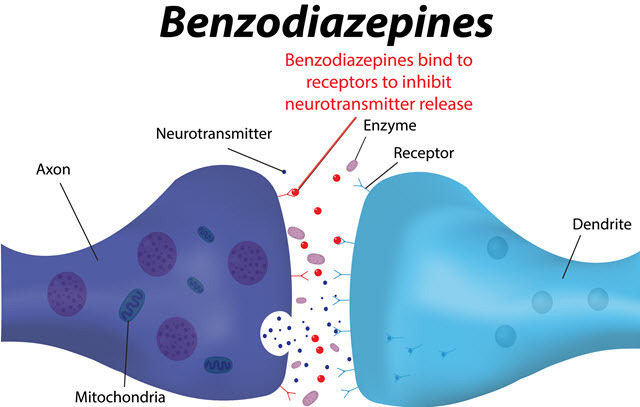 Benzodiazepines work quickly to put you to sleep, so no more long and frustrating wakefulness before falling asleep (sleep latency), then keep you asleep, freeing you also from waking. Benzodiazepine sleep medications are only to be used under the direction of a physician. They can be habit-forming and are typically only licensed for short-term treatment. There are risks for withdrawal if used for more than 2 weeks and your doctor should wean you from them gradually. Side effects can include headaches, nausea, confusion, dizziness and drowsiness, depression, and many more serious problems. Benzos are also commonly abused and easily overdosed.